After 9-11, the American people were understandably angry, wanting someone to blame. Osama bin Laden was the target of most of the anger, and rightfully so, given his leadership in Al Qaeda, the organization that planned and carried out the 9-11 hijackings. Mr. Bush’s call for the United States and its allies to attack states sheltering Al Qaeda members, especially the Taliban government of Afghanistan, seemed reasonable to most Americans. However, it was not. The CIA had the right idea–send small special forces units in to hunt down Mr. Bin Laden and his allies and halt the effectiveness of Al Qaeda in Afghanistan. Instead, Mr. Bush, on the advice of Mr. Cheney and Mr. Rumsfeld, decided on a full scale attack on Afghanistan for the purpose of destroying the Taliban government. The history since then has been one of intractable problems–a resurgent Taliban, the corrupt Karzai government that lacks the support of the majority of the people, a rising number of deaths and injuries to U. S. and allied soldiers. What is most dangerous is the increasing danger of conflict with nuclear-armed Pakistan. 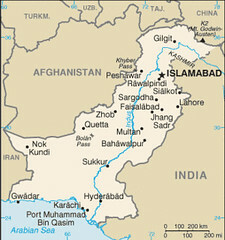 The NATO attack on Pakistani positions, ostensibly in self-defense, killed two dozen Pakistani troops. In response, Pakistan closed the border with Afghanistan, cutting off 30% of allied supplies. The Pakistani people, especially in the western regions, hate the United States and are pushing for a new Islamic government in Pakistan. The present government hangs onto power by a thread. If that government falls and is replaced by one hostile to U. S. interests, what will allied forces do if attacked by Pakistani forces? They will have to respond in self-defense, and conflict may escalate from there. While one might argue that this will not lead to nuclear conflict since even as Islamic government would not want to face the total destruction that results from a massive allied reply to any nuclear attack, making such an assumption is dangerous. A government totally dedicated to the tenants of extremist Islam may want to go out in a flash of martyrdom if it resulted in the loss of a U. S. base in the region or in a large number of American casualties. It is only of limited comfort that Pakistan does not have a delivery system to send a nuclear weapon to the United States–unless they employed terrorists. The United States needs to remove its forces from Afghanistan, allow the Karzai government to negotiate with the Taliban and other interests to set up a solution to the armed conflict raging between tribes and warlords in Afghanistan. The U. S. should have learned its lesson in Iraq–which has a Shite government friendly to Iran, which has done nothing about the wholesale persecution of Christians, and which most likely will not be sufficient to maintain order, even with several thousand mercenaries hired by the United States government. An immediate withdrawal would be ideal to avoid further costs of the war, both in lives, money spend, and in costs to the reputation of the United States in Central Asia and in Muslim countries in general. Then the United States needs to pursue a more humble foreign policy focused on American interests with war being used as a last resort, not a first resort.